A molybdenum metathesis catalyst containing an unconventional ligand can make trifluoromethyl-substituted Z-olefins rapidly and selectively. Trifluoromethyl-substituted olefins increase bioavailability of pharmaceuticals, and they are also important groups in agrochemicals and advanced materials. However, there are few ways to synthesise them, particularly stereoselectively. 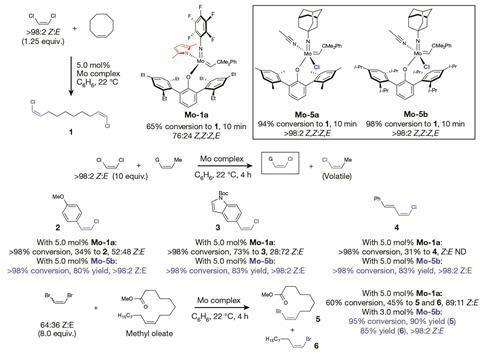 While investigating the mechanism of metathesis catalysts that produced halide-substituted olefins, Amir Hoveyda, at Boston College, and his colleagues noticed a molybdenum metathesis catalyst reacted with Z-1,1,1,4,4,4-hexafluoro-2-butene to produce Z-trifluoromethyl-substituted olefins with more than 98% stereoselectivity in minutes to a few hours at room temperature. ‘It’s surprising that this catalyst is so reactive, so efficient, and at the same time so selective,’ Hoveyda says. Selective olefin metathesis reactions are challenging because the reaction is reversible. During metathesis, a metal catalyst snips two olefins in half and recombines the pieces to make new olefins. But as the reaction proceeds, the catalyst can also start separating and rearranging the product, destroying any E/Z stereoselectivity originally created. The one molybdenum metathesis catalyst that could react with this olefin is unusual: it contains chloride, an electron-withdrawing ligand predicted to hinder metathesis. 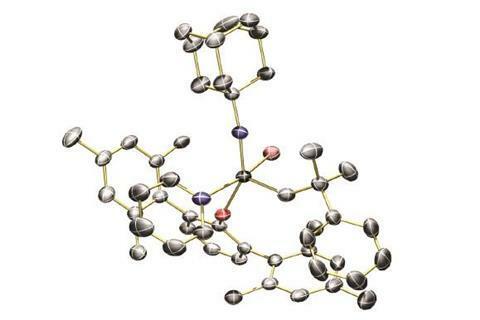 In this case, the chloride ligand pulls enough electron density away from the molybdenum that the metal craves electrons enough to react even with a hindered, electron-deficient olefin. The chloride is also small enough to make room for the CF3-containing olefin to attach to the catalyst. Stefan Bräse at the Karlsruhe Institute of Technology in Germany says this reaction is particularly important for industrially relevant compounds, as over 80% of crop-protecting chemicals contain a halide, often fluorine. Some CF3-substituted olefins are used as stable structural and electronic analogues for amides in pharmaceuticals. This route to CF3-substituted olefins is also more atom-economical than previous routes using olefination reactions, he adds.